The poetry of Brittany: coastal walks, wide sand beaches, open skies and green hills, plus delicious seafood, paper-thin crêpes and bowls of local apple cider. History at every turn, national monuments, granite and slate ancient village churches, and Celtic pride, music, art, and heritage. 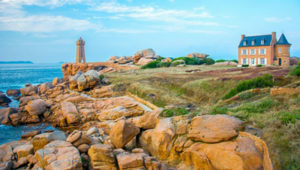 If this is your image of a great place to call home, either as a permanent residence or as a holiday retreat to recharge your batteries, then you can start your search right here with our property guide to Brittany. 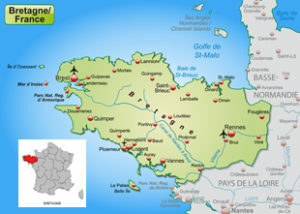 The region of Brittany (Bretagne) in the north west of France is composed of the departments of Finistère (29), Côtes d’Armor (22), Ille-et-Vilaine (35), Morbihan (56). Together they form a peninsula surrounded by the English Channel, the Bay of Biscay and the Celtic sea. It pretty much corresponds to the historical province of Bretagne, a cultural and historical region of Breton identity. Lower Brittany (roughly, west of a boundary from Saint Brieuc to Vannes) has maintained a distinctly Celtic language, Breton, spoken by around 400,000 people, which is related to Cornish and Welsh. The population of the administrative region of Brittany is 3.237.097 as per official figures published by Insee in January 2015, with every department showing a positive increase in population. The top five cities in order of population are Rennes, Brest, Quimper, Lorient and Vannes. The region has so much to offer, especially for families, walkers, and cyclists, and it is heaven for seafood lovers. 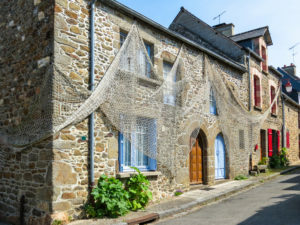 Just don’t expect to find isolated French-only enclaves, the fact is that in most areas you’re likely to hear Brit voices among the Breton, as overseas buyers account for an increasing percentage of rural property purchases. 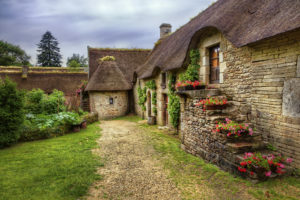 It is part of the Breton culture to own your property (as opposed to renting) and that characteristic makes the Brittany property market rather dynamic. The rule “the closer to the coast the more expensive the property” also applies in Brittany, and therefore sea-view properties will come at a premium. On average, however, Brittany is cheaper than many other regions of France. If you are looking for a bargain – or at least great value for money – you would do well to concentrate your search in central Brittany, along the N164 road all the way from Merdrignac (Côtes-d’Armor) to Pleyben (Finistère). If it is the attraction of the sea that made you chose Brittany you will find quite a difference of pricing from one coast to the other. 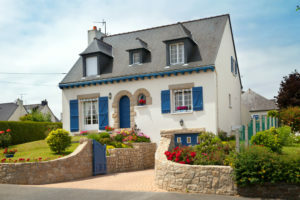 The Morbihan coast, having gained popularity with Parisians and their maisons secondaires, is more expensive that the coastal areas of the Finistère and the Côtes-d’Armor. The climate in the northern region of Brittany is largely oceanic/maritime in character and influenced by the Gulf Stream, which usually means winters don’t get too cold and summertime is pleasant if not baking hot. August is the time to take a dip in the sea at one of Brittany’s stunning beaches! You should come to expect plenty of cloud cover and breeze, while rainfall is highest in the western reaches along the Atlantic coast. Average temperatures for Rennes. There will inevitably be small regional variations according to coastal/inland location. Expect warmer temperatures to the east of the region. For those travelling to Brittany from the UK, there are several cross-Channel ferry options. Brittany Ferries runs services from Plymouth to Roscoff and Portsmouth to St-Malo, while Irish passengers can travel direct from Cork to Roscoff. They also runs services to three ports in adjacent Normandy: Cherbourg, Caen and Le Havre. From those travelling by air from the UK and Ireland, there are several airlines that fly into Brittany’s regional airports. These include Dinard, Rennes and Quimper. Just over the border into Loire is Nantes airport, which is equally handy for southern Brittany. For those travelling by train, Brittany is well served with services from Paris. From Gare Montparnasse, allow 2 hours to get to Rennes and 4 hours for Brest or Quimper by TGV (high-speed train). Make your booking with Voyages-SNCF. 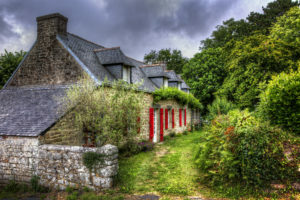 When you define your search criteria for your home in Brittany it is, as always, important to identify the purpose or use that the property is intended for. If you are buying as an investment for example, your main focus is return on investment and occupancy rate, so access to the main tourist sites and an airport or ferry becomes critical, while if you are buying as a permanent home for a young family, your choice may be based on schools, shopping and services. If you settle near the coast you could be shopping in chic St Malo, walking the dramatic cliffs in Finistère or swimming on the beaches of Morbihan warmed by the Gulf stream. As you go inland, prices will start to go down, and you’ll find rolling hills and heathland and many a picturesque villages with a gentler pace of life. This also means that the house might be slower to resell, should the time came when you need to put it on the market. While a low purchase price is incredibly tempting, remember that the cost of renovation per square metre will remain the same, so make sure that you take into account any improvements or extensions in your budget, and that your work out the maintenance and upkeep costs as well, particularly if you are buying property with land. Brittany has something for every lifestyle, so it is more important than ever to define what your priorities are, and keep them in mind when you visit on your viewing trip. Prices are not the cheapest, no surprise in such a stunning and popular area, and the supply of properties for renovation reduces year by year. After all, this has been a popular area for retirees and holiday-makers for many years pre-dating the advent of the low-cost travel to France. Nevertheless there is still good value to be found and if you put your feelers out, work with the right agents, you may just come across your dream house. It literally means long house. Stone longères are traditional one storey long properties found in rural areas in all the departments in Brittany. Granite was usually used to build these properties and they were placed in such a way that the back of the house was facing the stronger winds. The average longère usually ranges from €150,000 to €300,000 depending on its size and location. Despite being part of the landscape of Brittany nowadays, the neo-Breton houses are a relatively recent construction and started to be built in the 1960s. They have slate roofs, white walls and very visible door and window surrounds made of granite. These properties offering many modern comforts start from €80,000. These properties can vary in style, they can be detached or terraced, but most of the time they are stone properties with slate roofs. They all have one thing in common: these cottages are all walking distance to the beach and were lived in by the local fishermen. Because of their proximity to the sea, Fisherman’s cottages start from €200,000 onward. The chaumière (from the word chaume for straw) thatched cottage is a familiar sight for buyers from the UK. Although they can be found in Brittany, however they are getting rarer and rarer to find on the market for sale. Some of the chaumières can be priced around €100,000, a reasonable price to reflect the fact that they need expensive re-roofing. A thatched cottage in good confition will set you back a minimum of €400,000. I want to be by the coast, but only have a budget of €150,000 for a detached 3 bedroom house. Where should I look? Coastal property always comes at a premium, however with Brittany prices being cheaper than the national average, you will find such properties close to the northern and western coast in Côtes-d’Armor or Finistère. The Morbihan offers a bit of warmer summer weather than the northern coast, but prices have naturally increased there in the last few years due to its popularity with Parisians looking for a weekend home by the sea. I am looking for a typical French community to spend my retirement in. How likely am I to encounter British expats in the region? Brittany bears a lot of resemblance with the UK in terms of landscape and climate. Combined with its easy access, it’s no surprise that it is such a popular region with British buyers. There is no risk that expats will change the local atmosphere, though, because Brittany is famous amongst the French for its strong identity and community… and if you really want to bond with the locals, what about learning a bit of the Breton language? I really want to own a weekend or holiday house in France but I only have €50,000. Do you think I could find something in Brittany? You might not be able to find a picture-perfect coastal cottage on that budget, but depending on your requirements it is definitely possible to purchase a small house for that amount. I would advise concentrating on rural, central Brittany, especially in villages on either side of the N164 road. They might need a bit of TLC, but if you have reasonable expectations you should have a good selection to choose from. 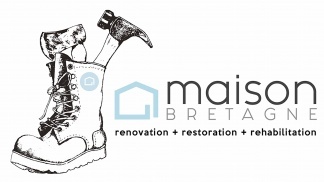 Breton property in need of renovations?